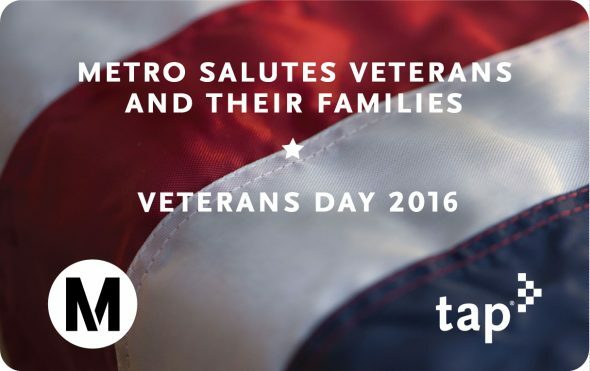 Metro will be operating regular bus and train service on Veterans Day, Friday, Nov. 11, with the exception of a few bus detours for Veterans Day parades. For details on detour information, see Metro’s planned service advisories page. Additionally, a limited amount of commemorative Veterans Day TAP cards can be purchased at one of our Metro Customer Centers and at the Blue Line Pacific Coast Highway Station – look for the special TVM header. Metro would like to wish a happy Veterans Day and thank all the brave heroes who have served our nation! Follow Metro on Twitter @metrolosangeles or @metroLAalerts to stay updated on service information and transit news. Today, I was proud to join Metro Chair John Fasana and Metro Board Member Jacquelyn Dupont-Walker to host the 2nd Annual Metro Veterans Luncheon at Division 13. It was a wonderful ceremony recognizing our Veterans with over four hundred Metro Veterans and guests in attendance…Metro has over 500 veterans within our ranks holding positions virtually everywhere – from operators and mechanics, to security, to the Chief Executive Officer. It truly is an honor to serve alongside these men and women now in our civilian jobs building and maintaining the greatest transportation agency in the world. Photos by Aurelia Ventura for Metro. Election open thread: With all precincts reporting, Measure M is winning decisively!